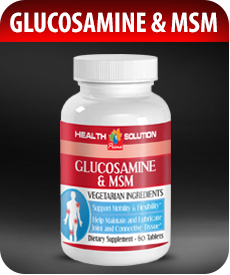 Glucosamine & MSM - Joint Support. 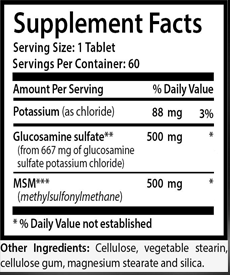 Glucosamine & MSM (1088mg) is Anti-Inflammatory & Joint Support. ​Benefits of MSM:is used for chronic pain, osteoarthritis, joint inflammation, rheumatoid arthritis, osteoporosis, bursitis, tendonitis, tenosynovitis, musculoskeletal pain, muscle cramps, scleroderma, scar tissue, stretch marks, hair loss, wrinkles, protection against sun/wind burn, eye inflammation, oral hygiene, periodontal disease, wounds, cuts, and abrasions/accelerated wound healing. ​Product Description: Glucosamine sulfate is a naturally occurring chemical found in the human body. It is in the fluid that is around joints. For example, the glucosamine sulfate that is put into dietary supplements is often harvested from the shells of shellfish. Glucosamine sulfate used in dietary supplements does not always come from natural sources.Glocosamine sulfate is commonly used for arthritis. It can improve pain and movement in knees affected by osteoarthritis. Those that have a family history of arthritis may want to consider taking glucosamine sulfate to help further strengthen cartilage found within your joints. Also, bodybuilders and other athletes may also benefit as the training involved in these sports places excess stress on the joints. ​​Other uses of MSM: include eye inflammation, mucous membrane inflammation, temporomandibular joint (TMJ) problems, leg cramps, migraine, headaches, hangover, parasitic infections of the intestinal and urogenital tracts including .